Despite being in the industry for almost two decades, the singer admitted, as he unveiled his sixth album Blurred Lines, that he hasn't banished his doubts. "One minute I'm very excited, the next I'm terribly nervous," he told MTV News. "Any time you release your music or you put something out there that you care very deeply about, you know, you're always a little scared. But for the most part, I'm always excited to give people my new music," he added. 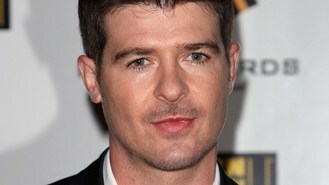 Robin's single, Blurred Lines, featuring TI and Pharrell Williams, has enjoyed chart success around the world while courting controversy for its "misogynistic" lyrics. "I always try and remind my fellow peers if you sell 10 million records that means 300 million people didn't buy it, so a little perspective is in order," he said.